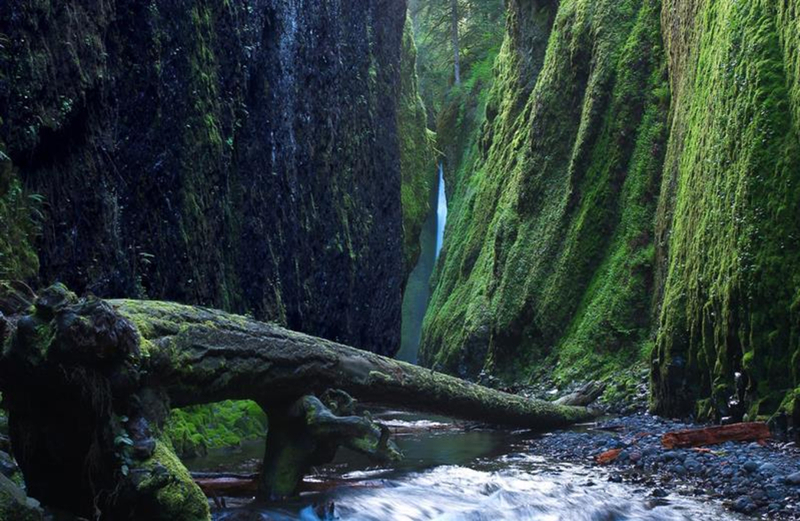 Oneonta Gorge is one of the most stunning gorges in the country, featuring canyon walls covered in lush green moss and clear, cold water plunging from picturesque falls. 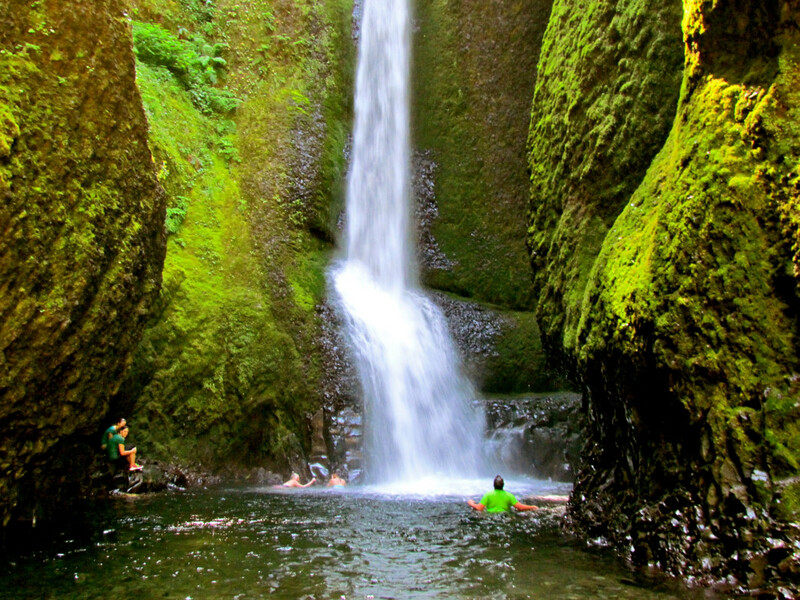 The Oneonta Gorge, located along the Columbia River Gorge, is one of the best hiking and swimming destinations in the area, which is saying something. This is an area that is teeming with tourists in the summer who come from all over the country to witness some of the Pacific Northwest's most impressive waterfalls. Just up the road from Oneonta is the famous Multnomah Falls, which is the tallest waterfall in Oregon. Hidden away in a lush, green, mossy canyon and tucked behind a series of logjam walls, there lies a destination that will easily consume an entire roll of camera film (or at least a good chunk of your memory card. 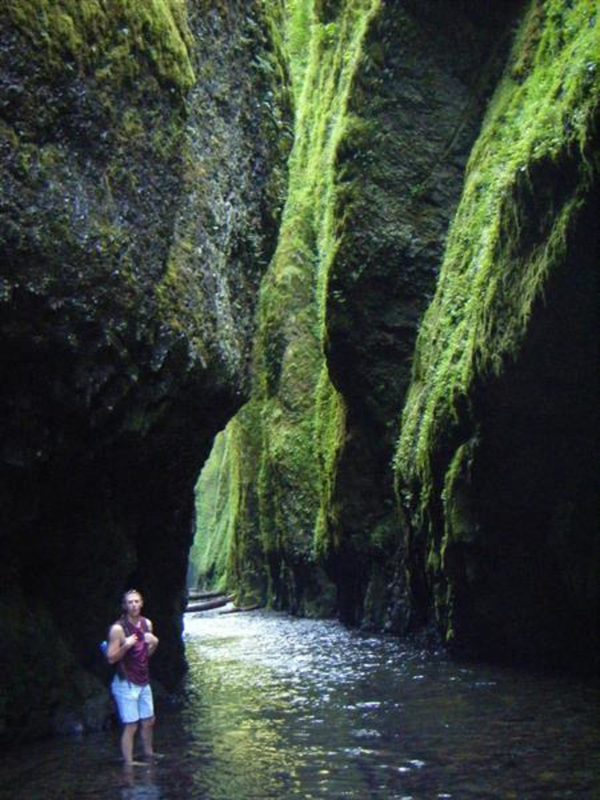 This place is the Oneonta Gorge and the Lower Oneonta Falls. Though it is not a long hike from the parking lot (only 0.6 miles or so), this area tends to be less crowded than other local waterfalls (though in recent years, the secret seems to be out). Able hikers hop and maneuver their way over massive, sometimes wobbly, slippery log jams and up the creek, into the gorge. This is a hike that should only be done when the water is low. Because the hike is dictated by the river, be aware that the logjam can change at any time and it may be to dangerous to negotiate at certain times. Located about 40 minutes outside of Portland, this is a great weekend destination when trying to beat the urban heat. It is a very short hike, but if you want other hiking options, you are surrounded by them on the Historic Highway. Wahkeena Falls is in close proximity. This is the trailhead for the Wahkeena to Multnomah loop and a little farther up the road is Horsetail Falls, which is the trailhead for Upper Horsetail Falls, among others. For those who are willing to do the aforementioned hopping and maneuvering, there are massive rewards and there's a bright light at the end of the literal and figurative tunnel. Once at the end of the hike, there is a wonderful little swimming hole with the Lower Oneonta Falls plunging into it. Though the water is quite cold, it is very exhilarating to take a dip and stick your head under the falls. This hike is definitely meant for those who are willing and able to walk up a creek bed, over the possibly unstable and large log jam, and up to at least your waist in cold water, depending on the time of year. This is not a suitable hike for small children because the water is about 3 feet deep at its lowest. From Portland, take I-84 east to exit 28 for Bridal Veil and drive east on the Historic Highway for about 5.4 miles to the Trailhead for the Oneonta Gorge. To get there, park near the Oneonta Bridge and walk down to the water on the east side. Cross the log jam and proceed up the river. The hiker simply continues out the way they came and back to the car.